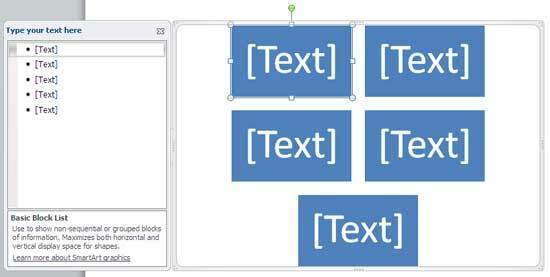 Excerpt/Capsule: Learn about how the Text Pane can help you in adding text to your SmartArt graphics in PowerPoint 2010. When a Smart Art graphic is inserted on the slide, you may or may not see the Text Pane. If you don't see the Text Pane, select the SmartArt graphic to make the bi-directional arrow button (highlighted in red in Figure 1) accessible. Then, click this bi-directional arrow button to show or hide the Text Pane. This will make the Text Pane visible on the left side of the SmartArt graphic, as shown in Figure 2 below. Tip: At any point of time, you can close the Text Pane by clicking the x button on the top right corner of the Text Pane. Within the Text Pane start typing to add the text, as shown in Figure 3. Whatever is typed in the Text Pane is also added on the SmartArt graphic. You can also find that the bottom part of the Text Pane displays information about the SmartArt graphic variant you are working with. To create a new line of bulleted text in the Text Pane, just press the Enter/Return on you keyboard. Type text for the new bullet, and you'll see that your SmartArt graphic has a new shape representing the new bullet, as you can see in Figure 4. You can also format the text in the Text Pane by first selecting the individual text within the Text Pane. Then, carefully right-click to view the contextual menu and mini toolbar, shown in Figure 5. Note that the mini toolbar allows you to change the font, font size, color, etc. within the Text Pane (and also within the Smart Art graphic). The contextual menu allows you to change the hierarchy of the selected text to previous or next bullet levels. 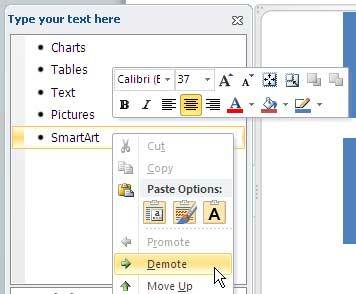 You do that by clicking either the Promote or Demote options in the contextual menu (refer again to Figure 5) -- do note that the Promote or Demote options may be grayed out in some instances -- their availability in the contextual menu depends on what type of SmartArt graphic variant you are working with. As we explained above, depending upon the SmartArt graphic variant being used you might find that the Promote and/or Demote options are grayed out. For example you cannot add a new bullet level, or even a demoted level to the Basic Matrix SmartArt graphic once you hit the limit of 4 first level bullets (see Figure 6). Some SmartArt graphic variants though let you add more bullets / shapes and are not as constrained as the Basic Matrix variant -- the Diverging Radial for instance lets you add many more bullets / shapes to an existing SmartArt graphic (see Figure 7).